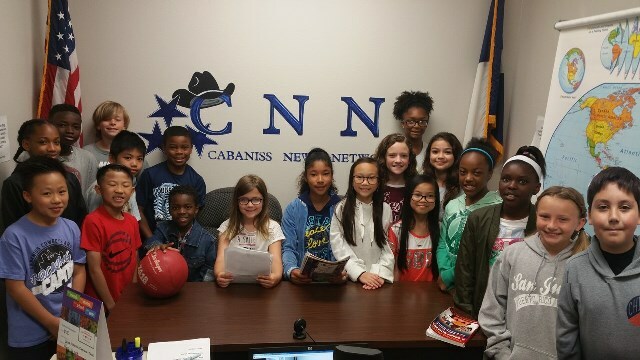 One of the many opportunities for students to stretch their talents and communications skills is the Cabaniss morning announcements. It takes many hard working students to make the daily production a success. Each program features three newscasters and a weather person, a Sports Report Crew, Techs for the camera and computer and a Stage Manager. The Cabaniss News Network is a student-run endeavor. Recently, CNN moved from the format called Safari Montage to YouTube Live. This involves more technical input but the Techies were able to handle it. This new format also allows parents to watch the 8:03 AM broadcast. A school email will be sent with the website link. Each day a new Youtube Live link is added to the Media website. Follow that link to watch the live broadcast of the news or click on it later to watch a taped version. The link is only good for that day's broadcast. Mr. Dye, our school counselor is the sponsor.